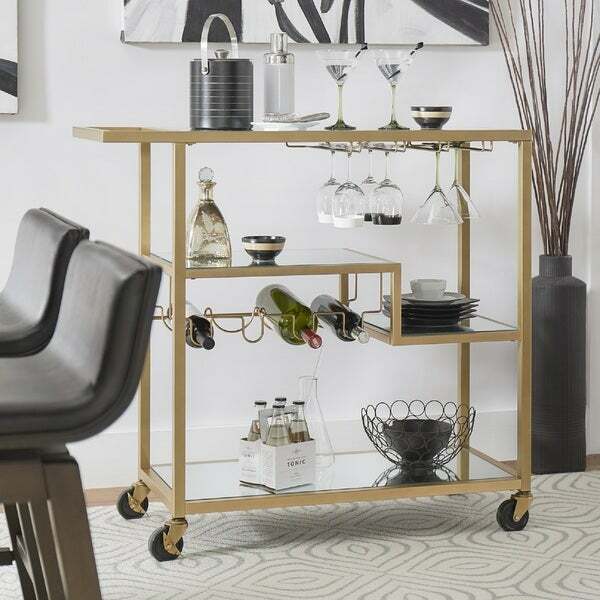 Clean and modern with a touch of glam, the Metropolitan Bar Cart from iNSPIRE Q® Bold is sure to make a statement with your guests. This piece is both stylish and functional, featuring wheels for easy handling and plenty of space for all your hosting needs, including a wine rack that can hold four bottles. The champagne gold finish and mirrored shelves will add a little sparkle and shine to your dining experience. At 40 in length, this bar cart is the perfect size balance between serving space and maneuverability. Host your next occasion in style. Assembly required - see below for instructions. At iNSPIRE Q®, our designer-curated lifestyles reflect current trends and timeless essentials, giving you the know-how to achieve your vision. With diverse style inspirations to choose from, you'll be able to find the one that speaks to you-or mix and match across collections for a style that's all your own. 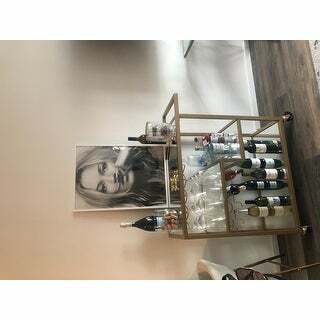 Love, love, love this bar cart! The gold and mirrors are beautiful and classy, while the size and weight make it very sturdy and completely appropriate to trust with heavy liquor bottles and delicate wine glasses. It did take a good amount of time to assemble and my model arrived with a large scratch on one of the top bars, which is why I took away one star. 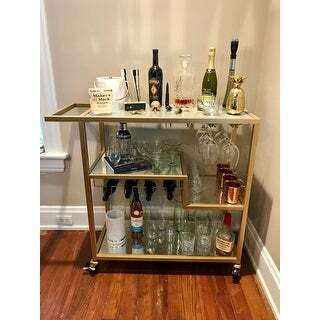 However, overall I think that this is one of the best quality yet attractive bar carts you can find - and I did *a lot* of comparison shopping. I absolutely adore this cart. I was shopping around for a while and I really appreciate the size, shelving, the stemware racks and the 4 wine racks. Assembly was almost impossible to do alone- I managed it, but with the bottom half on backwards............................... too complicated to fix by myself so I left it. The patina is difficult to keep clean, and the glass ends are already starting to wear but other than that I love this cart and get compliments every time someone new comes over. I nearly cried when the box arrived and I discovered the cart was in about 50 different pieces that I had to assemble. But I was able to do it on my own and it really wasn't that difficult as long as you follow the instructions. There were a couple of minor scratches and scuffs on the metal itself but not that's really noticeable. The end result ? Really really gorgeous ! 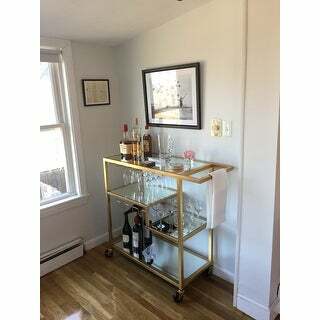 Splurged a little and got this beautiful bar cart for the gold & glass design which was going to fit perfectly against our exposed-brick dining room. 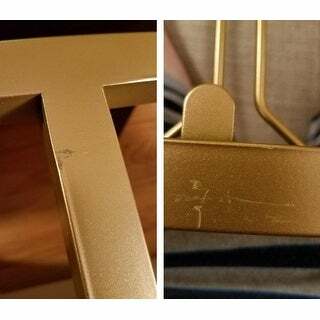 However, we were disappointed to see that multiple pieces already had scratches. We ended up keeping it despite this because we saw that the product was out of stock. We love the way it looks and have gotten many compliments on it. Cart looks great, just like in pictures. It definitely helps to have a second person there to assemble it, as the final step to bring both sides together is a little cumbersome, but the finished product fits the bill. Very sturdy, looks like it should last well. One of the large panels of glass did arrive broken in my shipment,and I have to compliment customer service at Overstock for handling the matter extremely well. 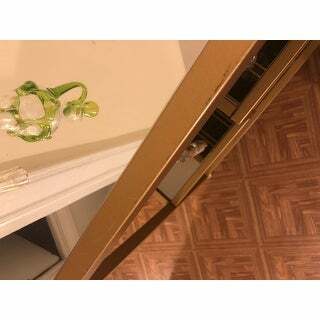 The glass is packed tightly in an inner box in large box, but unfortunately was still broken. Upon reaching out to Overstock, I included pictures and the part number, and within 1 week a replacement piece arrived to my home from the manufacturer. I am impressed with how seamless the process was with no questions asked, they did a great job. 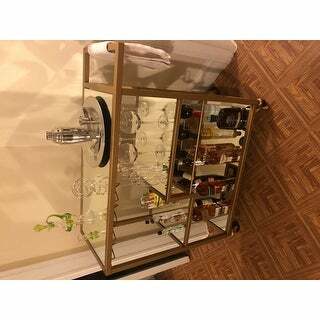 This attractive wine cart was put together with relative ease in a short amount of time. In our eagerness to get to the completed cart, it was only then that we realized that there were scratches and a dent on some of the pieces. Looking online for how to contact Overstock to determine what might be done, I realized that the item had sold out and was on back order. So you can imagine my delight when the agent recorded my findings and set about how to remedy the situation. Within just a few days, pristine replacement parts arrived with instructions just to dispose of the damaged parts rather than return them. I now have a beautiful wine cart which receives frequent compliments from visitors. Thank you and kudos, Overstock! 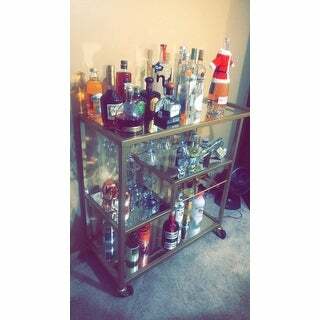 Love my new bar cart!!! Definitely took 2 people to put it together but not too complicated. The "gold" part is scratched in a few places and one of the glass racks causes the glass to sit crookedly. Those defects are minor though and it a really stunning piece and fits so much on it!! I recommend the cart. 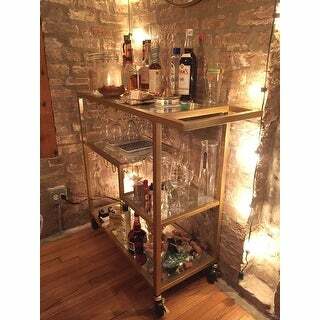 This bar cart is fantastic! We always get compliments on it, and it is great quality. Fits all of our bar needs and is perfect in our dining room. Thi was the biggest hit under the Christmas tree. My only regret is that I didn't buy one for myself before they were all gone!! Best I've seen. Cause it has a place for both wine bottles & wine glasses. Pretty simple to put together, I did it by myself in an hour or so. I always get compliments on this cart. I like it much better than smaller ones I’ve seen at homegoods etc. This is a stylish gold bar cart. It came with a few small scratches so not perfect but otherwise it's fine. This cart serves its purpose but I'm not as in love with it as I thought I would be. The gold is matte and looks like it would scratch off if hit wrong. The construction was simple and its nice to have the glass racks. This cart is perfect! I adore this cart! 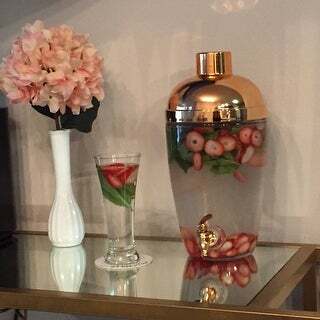 It has great storage for glassware, wipes down easily, not terribly hard to assemble, and the gold color and finish is so great. Love the look very elegant and looks amazing!! When i bought i thought it was going to be pretty compact but it turns out to be pretty big. It’s nice and again it looks like it’s from z gallery but unfortunately i had to return because it was too big for the space i wanted it for. I love my cart! It has so much storage for the bottles and glassware that I’ve collected throughout the years and my travels! Wheels move easily on my carpet. Keyword: SPACE!!! And it’s got lots of it! Really lovely looking and very easy to build! Great product! 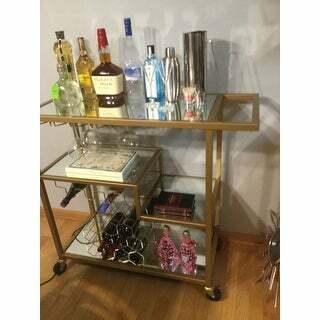 I really like the look and function of this bar cart. It was pretty easy to put together and works well, but there are some scratches in the finish which detract a bit. 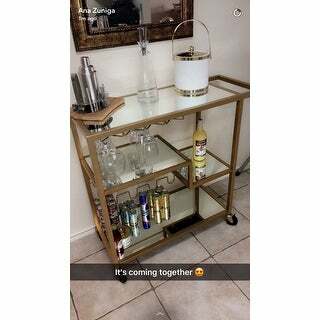 This Bar cart is truly a beautiful addition to any household. Sofisticated, chic and modern vibe. Very easy to put together only took me about 30-40 minutes to put it together. However, I have to agree with the rest of the buyers the bar came scratched which is truly unfourtante. They aren’t as noticeable but it is still disappointing. Also the wine glass rack were too small to hold/hang my wine glasses but my champagne glasses did fit as you can see in the picture. Very odd and also yet again dissapointing. Other than these two issues I am content with my purchase. Very nice! 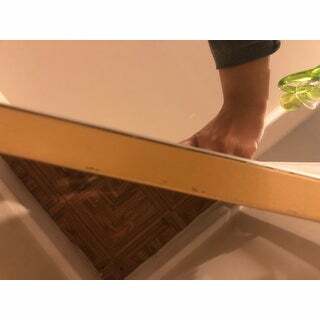 I like the gold tone and the mirrors. Very roomy! "How much does the cart weigh?" "Can this be used without the wheels?" We do not advise removing the wheels. "What are the dimensions of the shipping package?" The box for this bar cart measures 45 inches x 19 inches x 9 inches, and weighs 61 pounds. "Is it possible to leave off the attachments for the wine glasses & bottle storage when building this cart? Or are they pre-attached to the shelves? " The wine rack is a separate piece and can be left out during assembly. The glass holders are pre-attached to the top fame and cannot be removed. I ordered this before, or at least, I thought I ordered this one, this past Monday but what was confirmed and what came was not this cart. 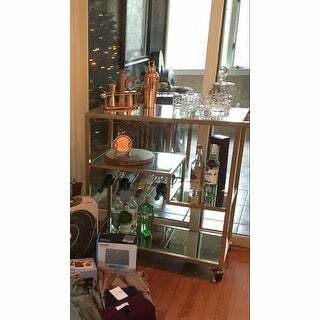 Now I have to return the Brass Metal Bar cart, unopened, because it is not the one I wanted. I HATE doing a return!